“We have determined that apparently there is content-related overlap,” explained Frauke Petry, a spokesperson for the right-wing populist Alternative for Germany (AfD). 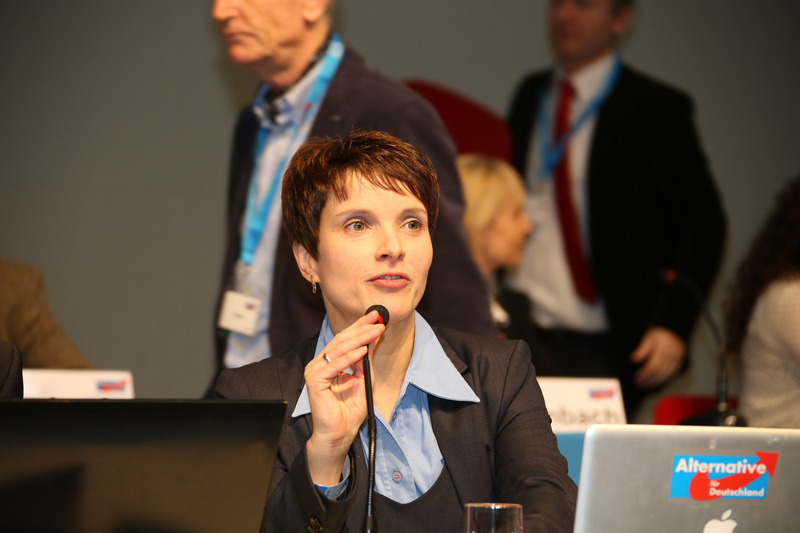 Petry spoke on Thursday (8 January) after she met with representatives from the anti-Islamist “Patriotic Europeans against the Islamisation of the Occident” (Pegida) alliance in Dresden. The AfD had apparently hoped to join together with Pegida in making policy. Petry said the “overlap” represented the bulk of the results from the meeting with seven members of the Pegida movement. In a statement released later that evening, Pegida itself said the organisation saw potential for shared policies with the AfD on many issues, including immigration and asylum policy. “We both agree that there is considerable room for improvement with regard to domestic security,” a representative from Pegida was quoted as saying in the press release. “An immigration law that is up-to-date would do great things for Germany,” she added. Speaking after Thursday’s meeting, Petry again rejected the view of most parties, that Pegida stands for racism and xenophobia. “We consider that to be false,” she stated. Pegida has announced that it considers the Wednesday (7 January) attack on the Paris-based satirical magazine “ Charlie Hebdo” as proof that Islamists do not fit in a democratic society. Instead, the alliance argues Islamists rely on violence and death as solutions. “But our politicians want to convince us of the opposite,” the organisation explained on its Facebook page. Vice chairman of the AfD Alexander Gauland expressed a similar view: “Anyone who has so far ignored or laughed at people’s worries over the imminent threat of Islamisation, are belied by this bloody deed,” he said. Meanwhile, the AfD’s party leader Bernd Lucke warned against sweeping judgements and called for “discretion”. “A violent crime committed by two extremists should not be attributed to an entire religious community, the majority of which consists of peaceful, respectable people,” Lucke emphasised. The AfD’s representative in the European Parliament, Hans-Olaf Henkel, had previously warned against misusing the attack to “heat up sentiments against foreigners”, in a statement on Focus online. Henkel said he himself would not negotiate with Pegida. Nevertheless, he stated that it was legitimate for the Saxonian branch of the AfD to want to meet Pegida initiators. At Pegida demonstrations, speakers not only took aim at radical Muslims but at Islam as a whole. Muslim burial rites were criticised, for example. Up until recently, Pegida’s organisers had turned down requests to hold talks with political parties, claiming it desired to remain nonpartisan. Interview requests from German media are also usually rejected by the alliance. But following Thursday’s meeting, the anti-Islamist alliance expressed the desire to pursue further talks. For weeks now, the “Patriotic Europeans against the Islamisation of the Occident” - 'Pegida' under its German acronym - have been demonstrating against supposed “foreign infiltration” of German society through Islam. The movement also campaigns against numerous other phenomena: against asylum applicants, against Germany’s and Europe’s Russia-policy and against the media. The largest Pegida demonstration included 18,000 participants and took place at the end of December in Dresden. Organisers and supporters of the Pegida movement consider themselves a “citizen’s movement” and publicly distance themselves from right-wing extremists. They rely on the “Christian idea of man” but church leaders accuse them of “racism veiled by religion”. Pegida uses fear of Islamic terror to spread general sentiment against refugees and foreigners. The alliance itself speaks of a defamation campaign. Interesting twist that anti-fascism is now a right-wing populists phenomena.